Is What We Are Passionate About! There are not many places in the world that offer a vibrant city full of modern facilities and then right on the doorstep, just 8 minutes by speedboat from the central entertainment district, a stunning tropical marine paradise. Sabah’s capital, Kota Kinabalu, is such a place. Tunku Abdul Rahman Marine Park (TARP) is home to Downbelow PADI 5 Star Career Development Dive & Adventure Centres on Gaya Island and Manukan Island. Named after Malaysia’s first prime minister, covering an area of 50m2, the Tunku Abdul Rahman Marine Park was gazetted as a national park in 1974. Consequently the area’s fauna, flora and marine eco-systems enjoy the protection of the government appointed environmental body, Sabah Parks. Both beginners and experienced divers will enjoy the dive sites within the park. TARP is also great for underwater photographers, providing lots of macro subjects in relatively shallow calm water. There are lots of very healthy hard and soft coral at the coral reefs. Our guests are often surprised to see such healthy corals so close to a city. We have 49 dive sites to choose from and our team of PADI professionals will choose the best dive sites depending on the sea and weather conditions as well as individual diver ability on the day. 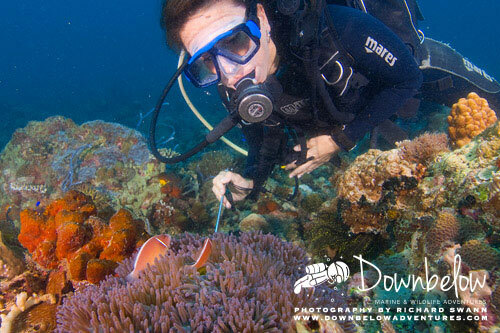 Dive sites are predominantly sloping coral reef and sand from 2m to 25m depth. There are also mangrove areas providing protection for juvenile fish. We have a small fishing boat wreck located between 12m-22m which is home to a variety of critters and offers a great intro to wreck diving, especially for those completing a PADI Advanced Course. Macro life is what we are passionate about, but having said that, there are plenty of larger marine creatures to be found in the park. 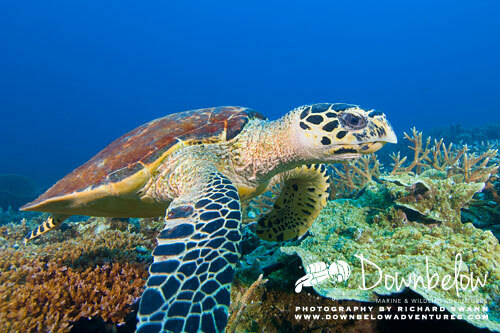 We regularly see turtles and rays and one of our nearby dive sites is home to a small group of Black Tip Reef Sharks. February to April is traditionally Whaleshark season. Although, sightings are not guaranteed and quite rare. But it is fun to know we share their water and they could appear any time during the season. Schools of barracuda, snappers and fusiliers are common. We often see cuttlefish, moray eels, lionfish and pufferfish. 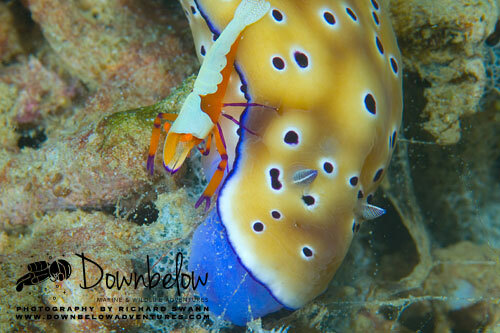 Nudibranchs are common, so too are all 7 species of clownfish, all of which can be seen in just one dive site! Many species of crustaceans, scorpionfish, pipefish, demon stingers, cuttlefish and stonefish can also be found here. We often find frogfish, ghostpipefish and, once in a while, the highly prized blue ringed octopus! Multiple day dive packages offer great value for money and you won’t see the same dive site twice – unless you wanted to of course, which does happen! What is the underwater visibility in TARP? In TARP, visibility ranges from 4m (at its worse) to 30m (at its best) we generally experience the best “Viz” from late April through to October. During whale shark season the viz is usually at its worse due to the amount of nutrients in the water. If we experience heavy rainfall the river run-offs will also reduce the visibility underwater. But generally we experience 8m – 15m most days. Can my non-diving family or friends join me on the dive boat? Our scuba diving and snorkeling are 2 different programs so each will be conducted at different sites in Tunku Abdul Rahman Park. Dive sites will be chosen based on their suitability for each program / course by either a qualified PADI Instructor (for Divers) or our professional snorkel guide (for snorkelers). However even though your family / group is booked on the different island activities, all of you will still be together during the activity intervals since we have a lovely beach diving centre that we return for refreshment, surface intervals and lunch. It’s a wonderful place to rest and enjoy the tropical surroundings. You will also be together during the land and boat transfers to/from the island. You will only be separated during your course and snorkeling activities. Unless specific requests are made to be on the same boat but this is subject to the dive site and conditions on the day. What if the weather is bad on my activity day - do I get a refund? It is extremely rare for us to cancel our activities. On average we only cancel a day once or twice a year! We are very fortunate to enjoy all year round diving and snorkelling. Only if it is dangerous do we cancel and if you are not able to re-schedule to another day, then we will offer a full refund. If it rains, we have shelter at our Dive Center on Gaya Island, when it does rain it tends to be quick downpours but the majority of the time it is a beautiful tropical sunshine. Are you affected by the monsoon? We are not effected by the monsoon in the same way as other locations. There are a few geographical reasons for this but the structure of the islands where we are based and the crocker range of mountains mean that we operate all year round with beautiful sunshine most days. It is quite rare to have a full day of rain. It could be a quick downpour or it could last into the evening. We experience the most rain in November & December. January – March is usually very dry.